Being able to log out a user on Mac OS X with AppleScript is useful. A common reason for needing to log out a user is to ensure a shared Mac is freed up for other users. 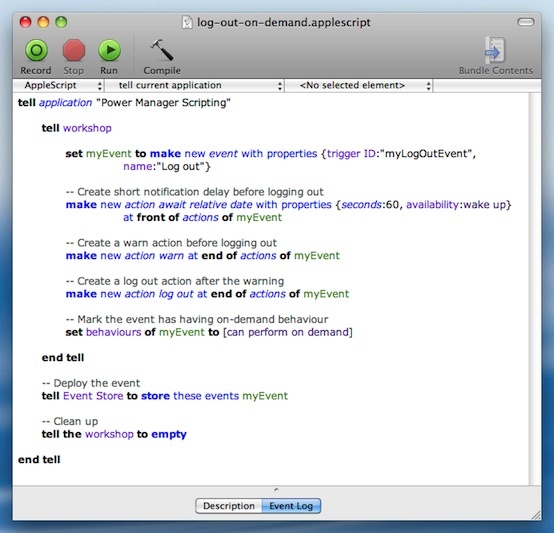 The simplest way of logging out an active user is shown in the AppleScript snippet below. The script asks the System Events process to begin logging out. This script, though simple, is not perfect and is not robust enough to use in situations where the user might cancel the log out, or where a rogue application may block the log out. Over the years we have become experts at automating the log out process. Thankfully all that experience is encapsulated in Power Manager for you to call upon as needed. Active users will be warned of the pending log out. Users logged in but Fast User Switched will also be logged out. Administrators will have the opportunity to cancel or adjust the log out. The script will work even if the login window is front most. The log out can not be stopped by standard users. The log out will not be stopped by application dialog boxes. The log out will not be stopped by stalled or rogue applications. The script will wake up the Mac when the log out is due. When you ran the script, you created a new event in Power Manager. This event has no triggers, so it will not be automatically scheduled. Instead this event has on-demand behaviour. Your new 'Log out' event will immediately appear in Power Manager's interface. 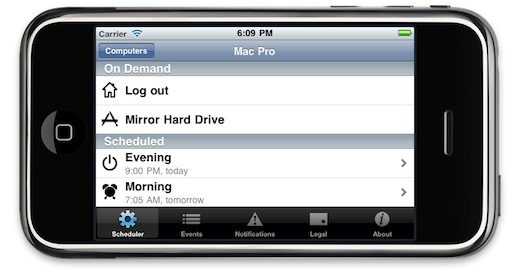 With your iPhone or iPod Touch using Power Manager Remote. If you want to schedule this event to occur at a specific date and time, or on specific days, go back and edit the AppleScript to add one or more triggers. The AppleScript included in the shut down recipe includes a trigger for its event. This article was posted in AppleScript, PM4, Power Manager, and Recipe and tagged AppleScript, dssw, log out, and Power Manager.